Over the years I have talked with and interviewed hundreds of artists and the majority of them have confessed to me that there is something spiritual about their work. That the creative process for them is in many ways like the thought experiments Einstein explored–more imagination than knowledge. They are tapping into something higher, something bigger, and something more profound. Some artists confess to meditating or praying before creating; some sit in silence; others spend time in nature; some chant or sing while working. Yet in the end, almost all would say, please don’t mention that in the essay, article, or profile. Please link me to some famous artist to contextualize my work. That is why when you read artist statements and essays everyone is inspired by Monet, Picasso, Matisse, Andy Warhol, Joseph Beuys, Cubism, Fluxus, Dada, Asian art or the Renaissance paintings they saw in Rome. If they earned an MFA this was part of their thesis, to explain how nothing is really new, but influenced by what others have done. If they don’t have an MFA, they are even more eager to prove that they are legitimate by connecting themselves to Richard Diebenkorn or Mark Rothko or Sol Lewitt. (Hardly ever is it Agnes Martin, Eva Hesse or Louise Bourgeois.) I’m tired of the art speak—trying to decipher meaning from a convoluted and academic language that few understand. I’ve literally had to read sentences as long as paragraphs in ArtForum and diagram them to understand what the author was trying to say. No one, outside of a small circle of art world academics understands any of it. I’ve laughed with gallery owners and curators about how none of us really understands the drivel. It’s the inside joke of the aft world. The apps that will create an artist’s statement for you is not a joke. I’ve read enough artist statements to know that this is what they sound like. And why does art require walls to be covered in text to explain what it is all about? Why do artists have to write a statement at all? If you need words to explain, then the art is not art. It’s not doing its job. It doesn’t stand alone in its power. But because everything does require an explanation these days and because the museums and galleries and even the artists want to control their “brand” and the message, art writing has become all fluff and public relations. A newspaper will literally run a press release from a museum or gallery about an upcoming exhibit and call it journalism. They don’t have to pay anyone to have art coverage. I worked with one editor of integrity who wouldn’t let a piece stand if it sounded too much like a press release. One. 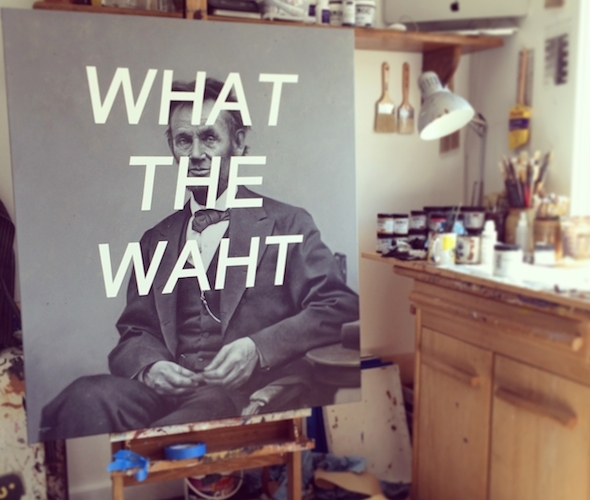 Museums and galleries now have their own blogs, YouTube channels, and Instagram feeds. They are even creating movie-like previews for exhibitions. And they need all of this because print media is on life support. Millions have been spent trying to come up with new models of doing this work. The Getty Arts Journalism program at USC ended this year, unable to find a new, sustainable model for arts journalism. The reality is, without advertising nothing gets printed—newspapers, magazines, even online publications. And the numbers are staggering. 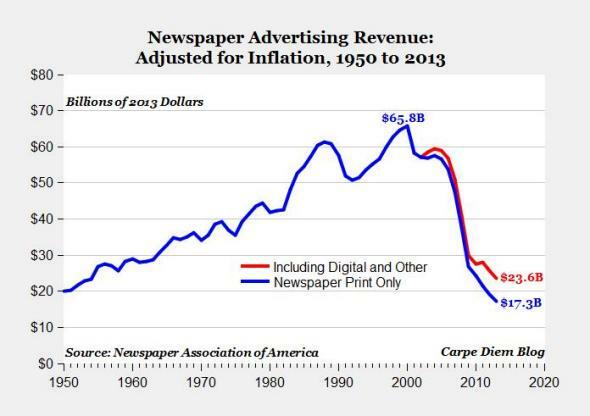 Since 2000, newspaper ad revenue has declined from $65.8 billion to $17.3 billion. Digital ad revenue only ups that later number to $23.6 billion. It is only $6.3 billion; a fraction of what newspaper revenue was 14 years ago. Google makes most of its money on Ad words—a convoluted algorithm system that will allow your ads to be found when key words are searched. Some words can now cost upwards of $10 per search. One can quickly rack up hundreds and thousands of dollars in costs to advertise while trying to figure out Ad words, or pay thousands of dollars to a consultant to create successful campaigns, but you need so many campaigns with so many words that it is cost prohibitive for most. Social media is now driven by advertising–Facebook, Twitter and Pinterest want you to advertise; everyone is trying to figure out how to reach their audience and find people who might be interested in their art. It’s like trying to find a needle in a haystack. Who wants abstract art in shades of blue inspired by Picasso’s blue period? How many people are Google searching that right now? I believe more strongly than ever that we need journalists, people willing to dig and find the facts and to present all sides or perspectives of a topic, even if that topic is a work of art, but we live in a world of biased ideology and one-sided news channels promoting intentionally planted “facts” to lead people astray. It’s all spin and propaganda making it nearly impossible to dig through the piles of garbage for the gem of truth. This demands huge swaths of time and research and digging and digging and phone calls and more phone calls to create an article that can be no more than 750 words and tell a complete story and for that you will get $75. It’s literally fractions of pennies on the hour. Money shouldn’t matter, but it does. The owner of one publication I’ve worked with has complained about how the gallery owners will not advertise to keep the publication going. And I get it, those ad dollars pay for my contribution to the publication, but this owner, a content creator themselves, has paid more to ad sales reps and website designers than to writers. It’s all in one’s perspective and point of view. Mine has shifted. I no longer want to be the one eating cake and the crumbs trickled down from the rich media moguls as penance for my work. I’d rather work a different kind of job and get a paycheck while spending some of my time writing for the sake of writing. I believe that writing about art is my art. But I can only point to a handful of my works where it truly has been: Phenomenal-Light Maestro James Turrell Paired with Colorado Sculptor Scott Johnson and Robert Adams Photography at DAM-A Bodhisattva Sees the West come to mind. When the work truly moves me and I can somehow find words to describe my experience of the work, then it means something. Then it is a creation of its own and not just an assignment. I don’t want assignments. I want to find a way to write about art that matters without contextualizing and plotting on some fabricated line of art history. I want to be so moved by a work that I must write about it. And in the end, isn’t that what it’s all about? Critical Condition, has big money replaced the pundit as the true authority in the art world? Thank you so much for this post. I really enjoyed it. Keep up the good fight! Leeanne- it saddens me to read this because when I started out wriitng about art in the west in the late 1970s it was similar to this, down to the ridiculous payments I would received. I am an optimist by nature and hoped things would be better, but obviously not. One thing that troubles me is that artists don’t seem concerned about it. In fact, I have heard artists say when I have tried to discuss the importance of art criticism, ” Well, OK, but what if they write something bad about my work?” The enormity of the misunderstanding about what art criticism is and what he means to a vital art scene is very discouraging. Suffice to say, whenever I read articles about art scenes that are not thriving, as in a recent NY Times article about Miami, I wish they would address the role significant art criticism in building a collector base to support galleries.. Thank you Katharine. I agree with your wholeheartedly about the significant role it can play. Thoughtful, intelligent response to visual art and all acts of creation is needed and will always be needed.